In this post I explained that there is, to some extent, a competition going on between the goals of our genes and our goals as an individual. As Keith Stanovich argues, building on Richard Dawkins' book The Selfish Gene, we humans have become aware of the fact that our genes' interests are not always in our own interests and that we can, at least to some extent, liberate ourselves from these genetic influences we do not serve us. There is another theme in Dawkins' book which Stanovich has built on which is meme theory. Dawkins, in 1976, introduced the thought that some types of ideas, which he calls memes may also be viewed as replicators whose sole purpose is to replicate. Memes are elements of a culture which may spread through a culture through upbringing, education, and imitation. In everyday language they may be thought of as ideas, beliefs, convictions, or belief systems. Memes may exercise control over individuals and groups by guiding their behaviors. Like genes, memes can be thought of as 'selfish' in the sense that they can spread themselves without having to be true and without having to benefit the individuals who hold them and the societies in which these individuals live. Analogous to saying that our genes are not there for us but we are there for our genes we might say that we do not acquire memes but they acquire us and we can be seen as vehicles for their propagation.This leaves us with the situation that some subset of the beliefs that we hold may be not in our interest. This category of memes is sometimes referred to as contaminated mindware. It is in our interest to be able to identify that subset of ideas and to resist them. 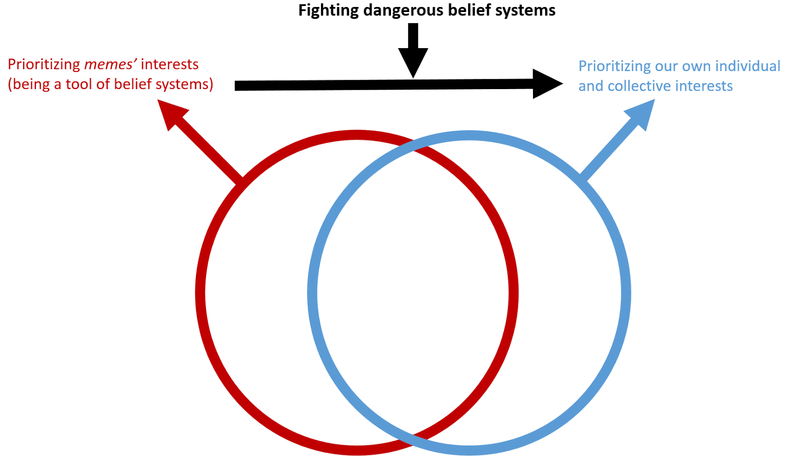 The most dangerous of these harmful belief systems, are (1) not true (not grounded in evidence), (2) undermining our well-being and/or that of others, (3) attractive (for example by being packaged in an attractive narrative), and (4) good at self-replication by (a) containing instructions for self-replication ("recruit new believers"), and (b) containing evaluation-disabling instructions ("criticism of this belief should be punished"). What we can do is to first recognize that some memes/belief systems can indeed be harmful. Second, we can learn to recognize them. Third, we can start to resist them. Building a culture in which any belief can be critically examined and in which there is full freedom to express criticisms is the key to freeing ourselves from harmful belief systems.